Autumn leaves are so valuable for your garden. You can rake them onto garden beds to serve as mulch. This can help protect your plants during the winter. After that, many of us still have plenty of leaves left. These are great for compost. Here are three tips to make the most of your autumn leaves. Gather leaves up in a tarp. I used to rake my leaves into a pile. Then I would pick them up by the armful, put them into a wheelbarrow and take them to the containers I use for compost. 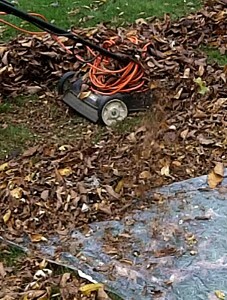 Chop up your leaves with a lawn mower. If you throw a bunch of wet leaves in a garbage can in the fall, by spring you’ll probably still have a bunch of wet leaves. Part of the reason is that the cold weather prevents the material from breaking down. But another part of the reason is that it takes longer for large pieces to break down than it does for smaller pieces. A quicker way to beak up your leaves is to roll over them with your lawn mower. You’ll end up with some nice small bits. When you grab a handful, it has the feel of peat moss. If you just mow your leaves, the bits will fall into your lawn, and that’s fine for your lawn. But if you want to use those those small bits in a compost pile, try the next tip. Use a lawn mower and a tarp. This is an experiment that wasn’t as successful as I had hoped it would be. Under the right conditions, though, I think it would work well. The idea is to lay down the tarp and, as you mow, spray the bits of chopped-up leaves onto the tarp. The tarp I used was very lightweight, so the breeze from the lawnmower flipped up the edge of the tarp and the chopped-up leaves sprayed under the tarp instead of on top of it. Raking some whole leaves onto the edge of the tarp was enough to hold the tarp in place. The other problem was that some of the leaves were still damp, so they didn’t chop as well as I would have liked. They didn’t spray as far as light, dry leaves would, either, so some of the bits were landing on the lawn instead of the tarp. Plus, the damp leaves tended to clog the lawnmower the way damp grass does. If you wait until the leaves are a little drier, this should work better. Tip: Don’t try to mow a tall pile of leaves. 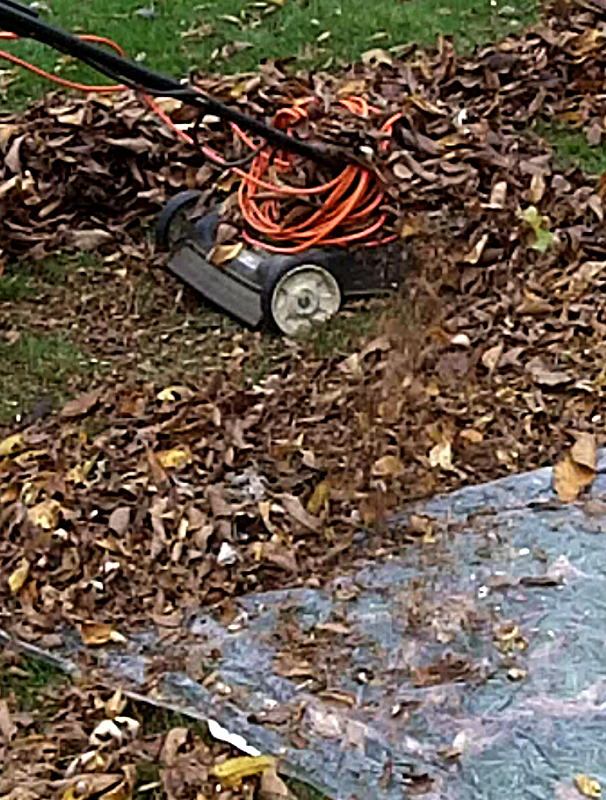 Starting with a big pile might seem like a shortcut, but it actually works better if you mow a flat row of leaves. What works for you? Please leave a comment and share with our other readers. Use a mulching riding mower with a bagger. Holy cow we mow them real tiny. then it shoots them into these bins I take the bin off take over to the garden and dump all around my plants. The soil eats it up by spring and protects it. It’s great! any mower with a bagger and dry leaves willl work great. Laurie, I bet your soil is marvelous! I always stayed away from baggers because I want the grass clippings to go into the lawn, but it would be so handy to have a bagger in the fall. Great idea! I never thought about using the grassbag for leaves. I’ll have to get ‘someone’ to try that next fall! Yes, I like the idea of getting “someone” to try it for you!